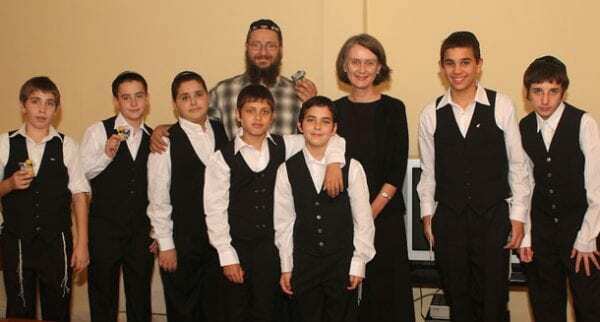 The Australian Ambassador to Israel, Ms Andrea Faulkner hosted a unique Bar Mitzva celebration at her residence last night for five children of the Kefar Chabad’s Or Simcha boarding school. The celebration, conducted in collaboration with Kefar Chabad, allowed the children to experience a truly magnificent evening to mark their entry into adulthood. The Ambassador said she felt privileged to be able to contribute to this very important event in the lives of the five young Jewish boys. “It was a pleasure to be part of marking such a unique milestone in a young boy’s life,” Ambassador Faulkner said. The children and participants enjoyed songs by Or Simcha’s choir which is made up of 10 children in the ages of 8-13, and various movies on the school’s work and the children’s lives in the boarding school as well as a delicious dinner. The children received tefilin from the Chief Rabi to Israel, Yona Metzger and decorated engraved pens from the Ambassador as a memento from the event. of new immigrants, and children whose parents were unable to take care of them. Or Simcha allows the children to enjoy a warm loving home and vibrant community life. The staff provides attention and support to the children and helps them gain academic, social and cultural values, to progress in life.